JUBA, South Sudan – For nearly 10 days following South Sudan’s military occupation of the disputed oil-rich area of Heglig, Sudan and South Sudan were on the verge of war. On Friday, April 20, the Sudan People’s Liberation Army, or SPLA, announced its withdrawal from Heglig, a move regarded by the international community as a positive step toward diffusing tensions between South Sudan and Sudan. However, the two countries are not any nearer to achieving a lasting peace as the Sudan Armed Forces, or SAF, continue to carry out aerial and ground attacks on territory in South Sudan, yesterday reaching a crescendo with the bombing of Bentiu, the capital of Unity state. Over the past two days, the SAF have allegedly launched ground military operations in the border areas of the South’s Unity state. 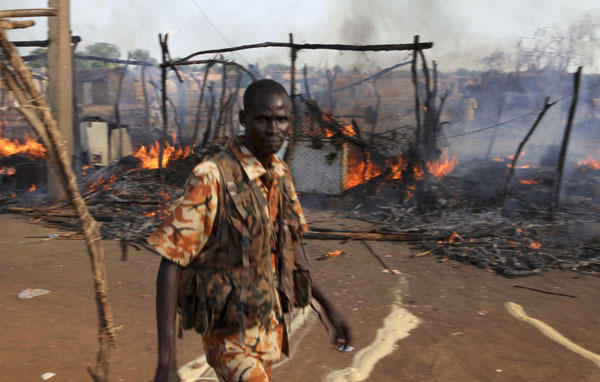 According to an SPLA source in Juba, the Sudanese air force has now bombed four different locations there. On Monday, the Satellite Sentinel Project published images showing Sudanese fighter jets perched along the border. These indiscriminate bombings resulting in the loss of civilian lives must stop. I remind the parties to the conflict of their obligation to abide by international human rights and humanitarian law, take all measures not to harm civilians, and guarantee the safety of international aid organizations and United Nations personnel and assets. The international community used its leverage to pressure the government of South Sudan to withdraw from Heglig and give talks a chance. Juba is now increasingly expecting swift international condemnation of Khartoum for continuing military intrusions in South Sudan. South Sudanese government officials emphasize that they are working hard not to be dragged into a war—a position echoed by the government in Khartoum. Both sides view their own actions as self-defense and say they are looking for a “way out” of full-scale war, said U.S. envoy Princeton Lyman in a briefing following visits to both capitals. “Now they have different approaches to how to get out of this situation, but both sides are looking for that,” Lyman said. The government in Juba hopes the United Nations Security Council and the United States will strongly condemn the regime in Khartoum for violating South Sudan’s sovereignty. According to Amum, the withdrawal from Heglig has once again proven that the government of South Sudan is committed to a peaceful resolution to the conflict, and the UNSC and the international community should recognize South Sudan’s peaceful intentions. However, Amum warned that the SPLA might consider going back to Heglig, and if that happens again, the South Sudanese army may move even further north. Domestically, South Sudanese widely supported the army’s decision to control Heglig, and officials may face a difficult task conveying to their citizens the reasons behind the withdrawal, especially when Sudan forces continue bombing over the border. Peter, a resident of Juba told Enough that the decision by President Salva Kiir Mayardit to order the withdrawal was good, mainly because the good relationship with the international community is very important for the country. However, if the bombing continues, the people of South Sudan would expect from the government to take action to stop it, he said. On the political front, both sides are ratcheting up the pressure, announcing their decisions to pull out of post-separation talks. In a statement to the press, Sudanese president Omar al-Bashir said the negotiations with South Sudan are over. Juba shares the sentiment. Speaking to Enough yesterday, Amum said that South Sudan will no longer engage Khartoum in talks over oil. Amum emphasized that South Sudan “will not export its oil through Sudan.” Instead, South Sudan will look for alternative ways to sell its crude, a topic thought to be at the forefront of talks between South Sudan President Salva Kiir and Chinese officials this week. However, Amum reiterated that the South Sudan government is ready to negotiate about other outstanding issues, such as border demarcation and withdrawal of Sudanese forces from Abyei, as per an agreement reached last year. But the news of the collapse of oil talks heralds far more unrest to come, as funds for both governments dwindle—prompting an increasingly desperate situation for Khartoum as the government faces strong armed opposition from the SPLA-N, now united, at least in stated motive, with Darfur rebel groups JEM and SSLA. It is this front in South Kordofan and Blue Nile that has poisoned the very fragile relationship between two countries: Sudan sees Juba behind the rebel forces in Sudan, while South Sudan continues to strongly deny such allegations and in turn accuses Khartoum of backing militia groups in South Sudan. But popular wisdom—indeed, even diplomatic discourse—suggests both sides are culpable. Odds for all-out war between Sudan and South Sudan are increasing. Today’s statement by Omar al-Bashir that the dialogue with South Sudanese will be done only through "the language of the gun" is troubling. The international community must use all of its possible leverage to bring the two sides back to the negotiating table. The proposed agreement drafted by AUHIP during the last round of talk in Addis Ababa on April 4, which includes immediate cessation of hostilities and has been accepted by the government of South Sudan, should be revisited and reconsidered by the governments both in Khartoum and Juba.